It started with a package of blank, hardcover books from the teacher supply shop. 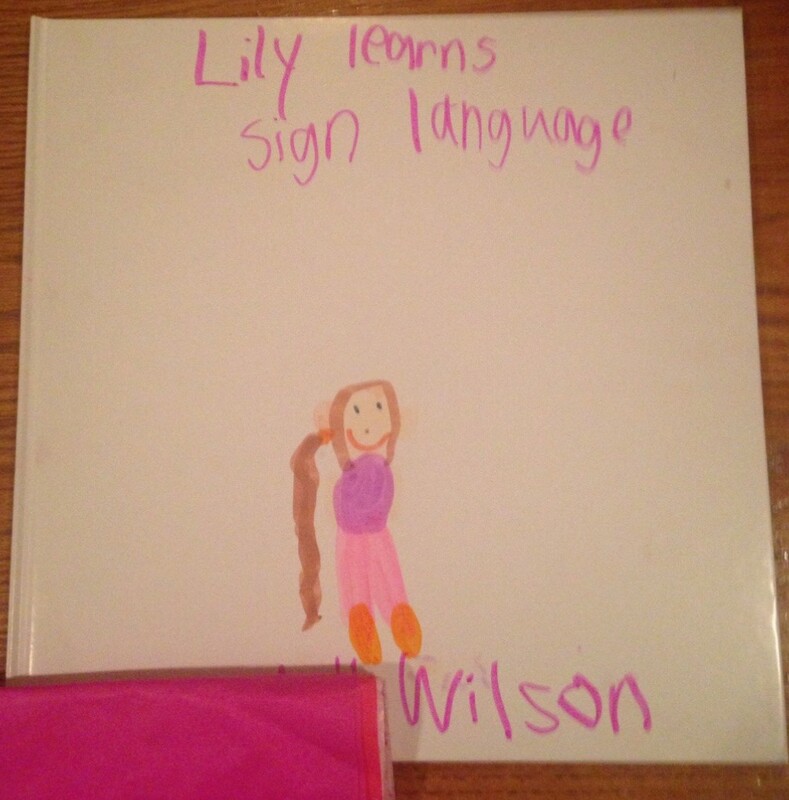 Since Brooke loves to draw and had taken to stapling her drawings together into books, I thought that book making might be a fun activity for her upcoming play date with one of the girls from her adaptive dance class. Not only would it keep them busy, I reasoned, but it would give Addy something to bring home with her when she left. Addy was all for it. She wrote and illustrated a fabulous (and hilarious) tale of a family meeting Katy Perry, and, if memory serves, hiring her as a babysitter after a concert. It was bursting with creativity. After each page’s completion, she came to share it with us. It was everything that I’d hoped it would be. Well, sort of. 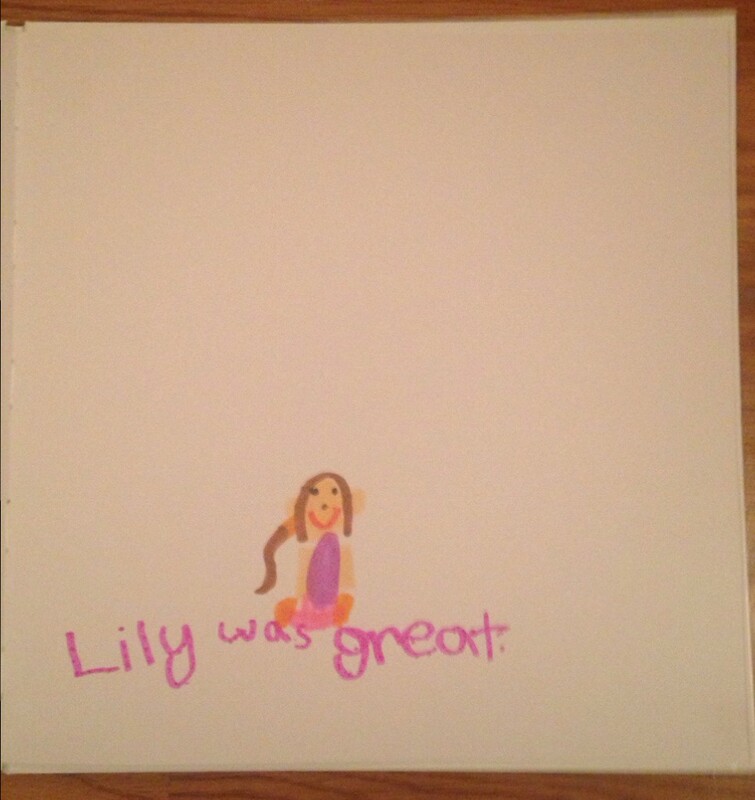 Brooke showed no interest in making a book or even in Addy’s book. 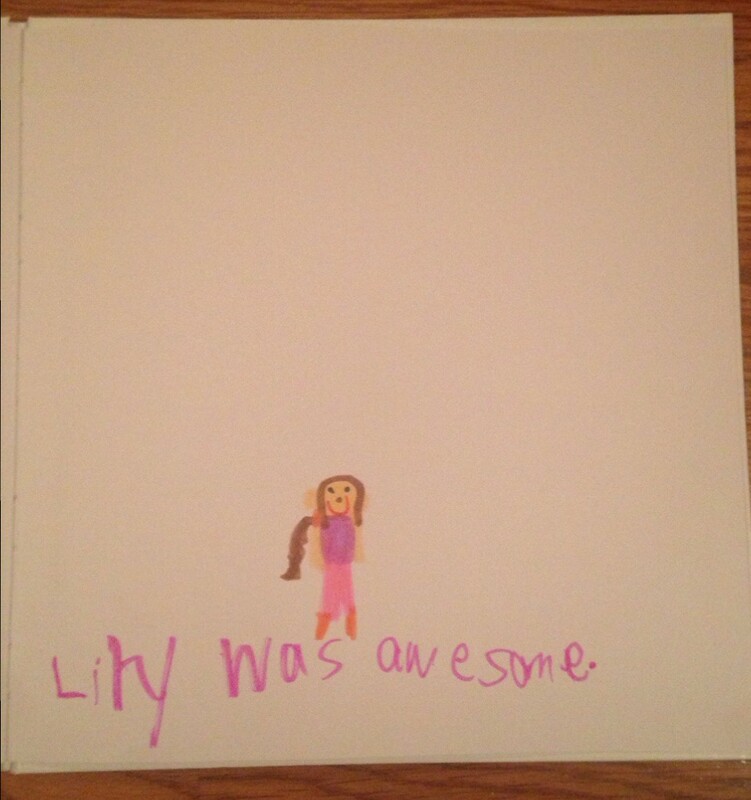 She drew on one page, mailing in the effort at best, and was done. That play date was a couple of months ago. I couldn’t even have told you where the blank books had gone since. But this past weekend, without a word to anyone, Brooke dug them out and went to work. 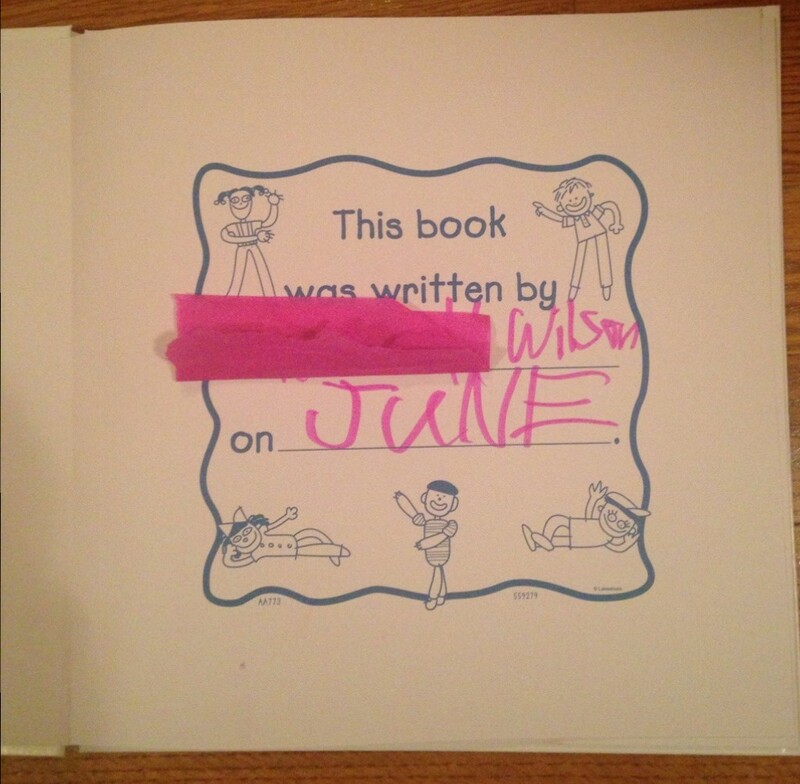 While everyone in the house was busy doing their own things, she made a book. Brooke’s books are now everywhere. From The Naughty Class to Perry the Monkey Learns to Dance. They’re on the floor in her room, on the table in the den, on the kitchen counter. They are, from what I can tell, mostly riffs off of other books or the premise of a favorite show. But always with a twist – a Brooke-ism. Reading like an homage to Elmo’s World or Peppa Pig, but beautifully, perfectly Brookified, they are so completely her. My current favorites are what I call the Adventures of Lily series. 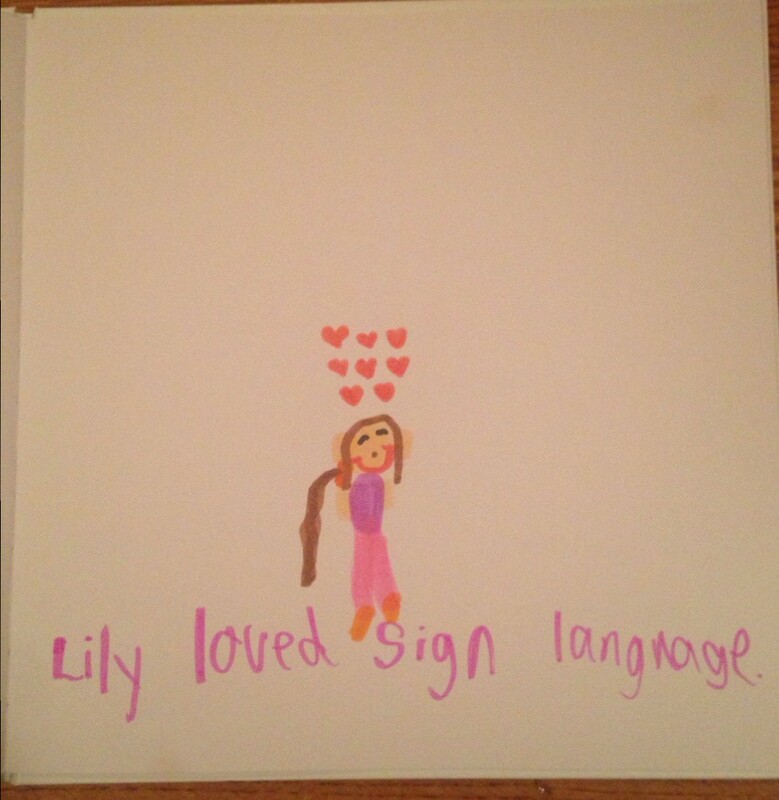 We have Lily Learns to Ice Skate and Lily Learns to Dance and Lily Learns Sign Language. 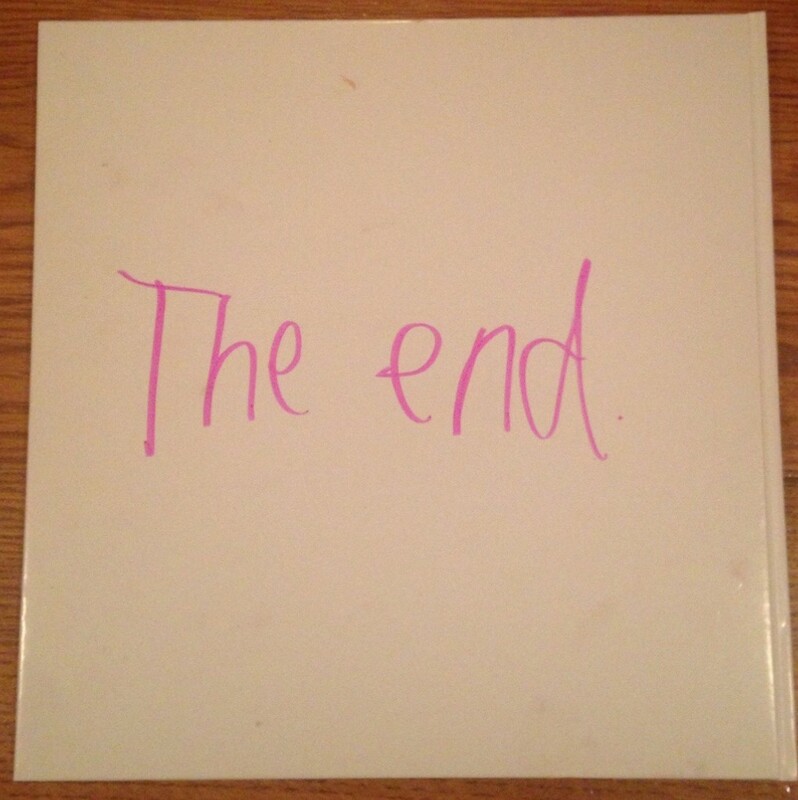 I asked Brooke if it would be okay to share her latest with you here. Yes, my cup runeth over with technical expertise . Apparently any other information is on a need to know basis and we, clearly, don’t need to know. 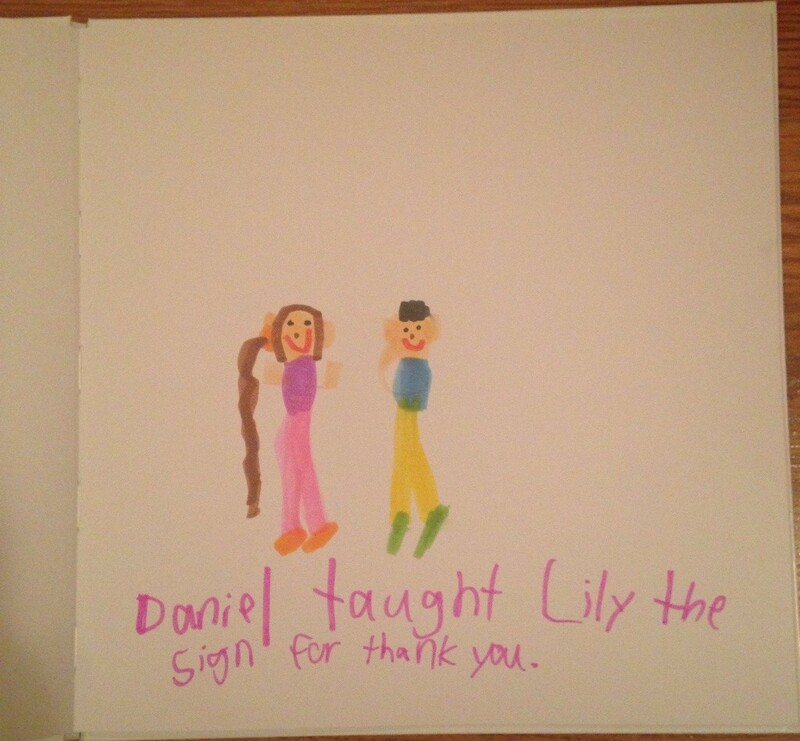 Can I just say how much I love that the first sign that Daniel taught Lily was Thank you. I mean, obviously, the very first thing that she needed to be able to say was, “Thank you for teaching me to say, “Thank you.” Gratitude is awesome. Hmm, so learning others’ languages and immersing ourselves in other ways of communicating can bring us joy and fill our lives with love? Tell me more. I don’t think we can discount the fact that Lily’s mom was pretty brave to wear those pants in public, but hey, to each her own. 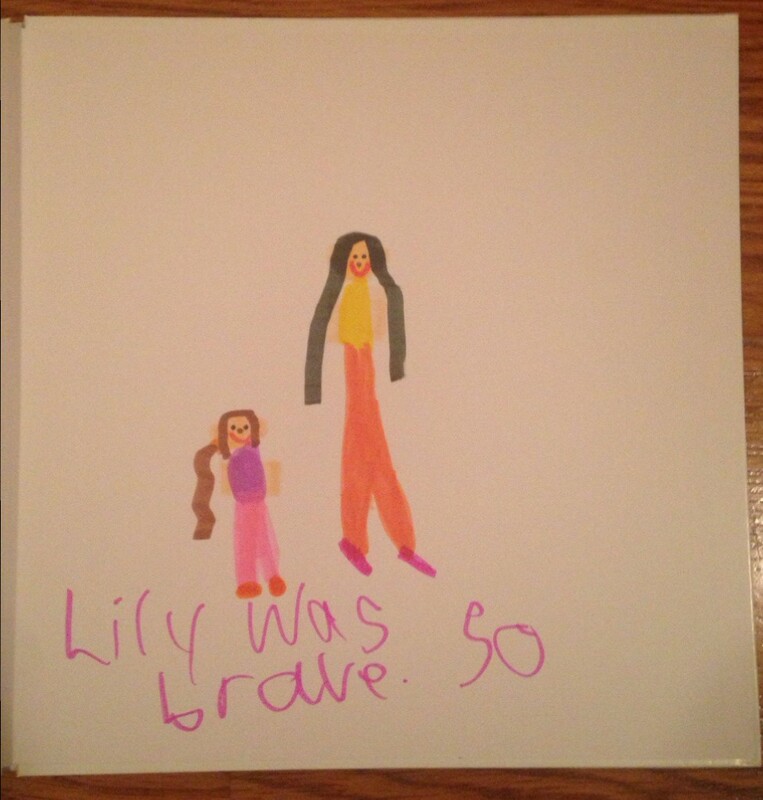 It’s worth noting that in every book that Brooke has written, Lily has been brave. Which I love. A lot. 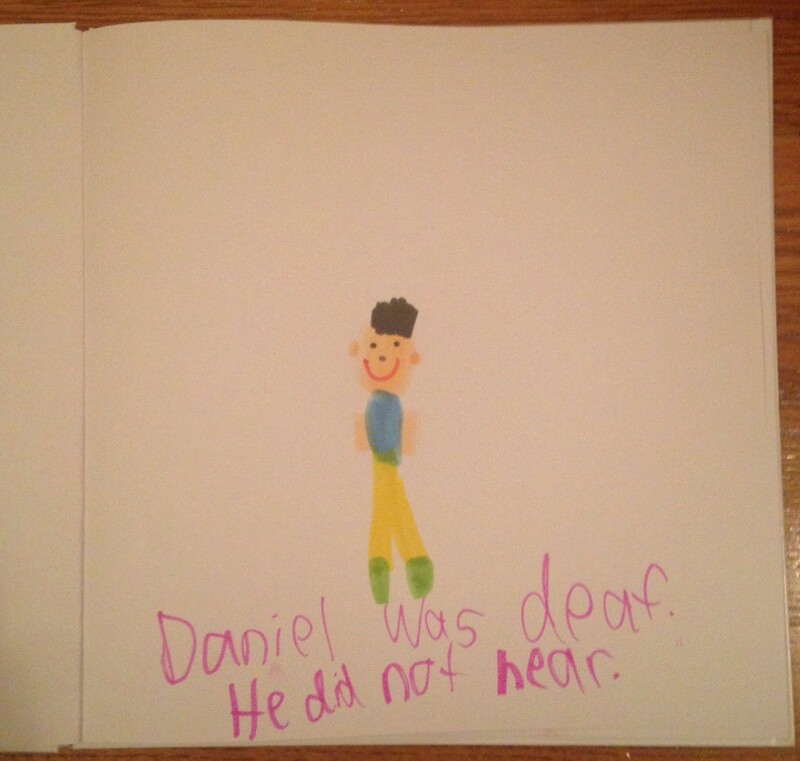 So to recap, Daniel is deaf. And happy. 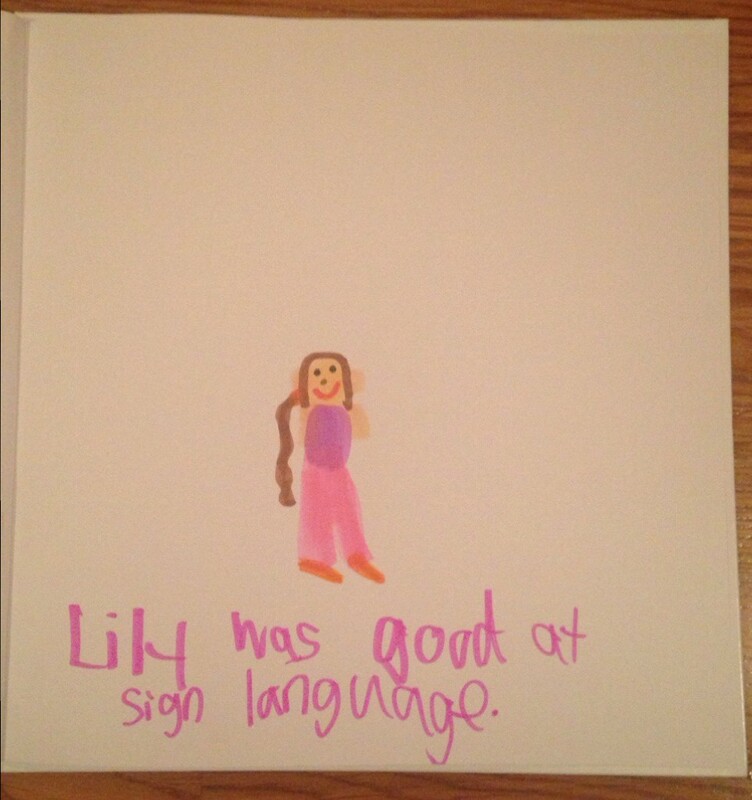 Lily is happy too because she’s learning to speak his language. The first thing she learns is gratitude. Once she learns to communicate with her friend in the way that is most comfortable for him, their lives are filled with love and joy and bravery and fulfillment … and orange pants. Any questions? 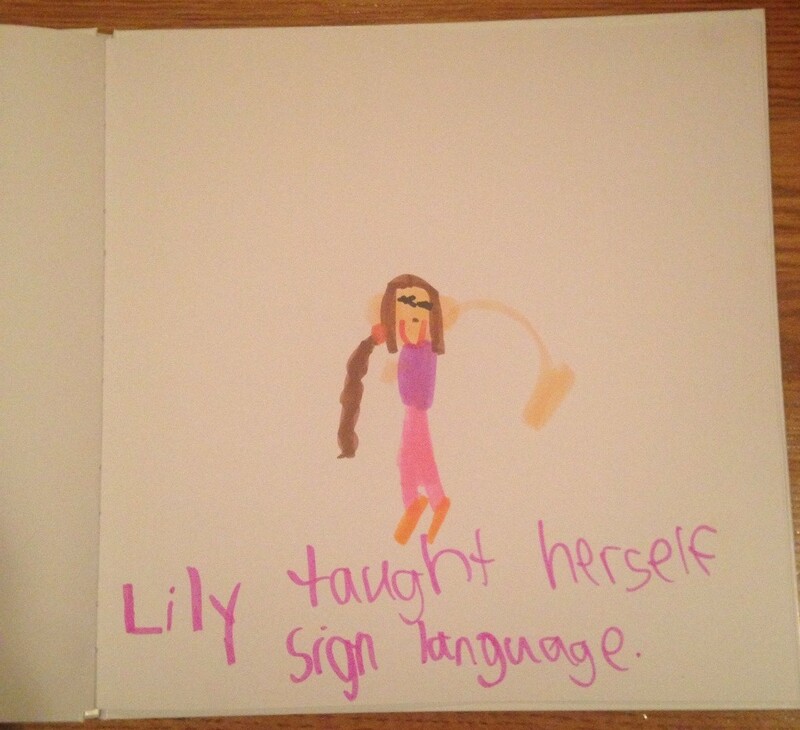 Ed note: I am so grateful to my girl for so generously (and bravely) giving us all the gift of herself. Thank you, sweet girl. Thank you. Ed other note: I swear I didn’t do this on purpose, but the opportunity to plug this fabulous fundraiser is too good not to mention here … If you want to own a piece of Brooke’s art, you can! Now through August 10th, Brooke is the featured artist on Paper Clouds Apparel. 50% of net proceeds of any sale of her artwork goes directly to her favorite place on Earth, SenseAbility Gym AND Paper Clouds is like the greatest company ever, creating a sustainable business model employing disabled workers at fair market wages. Please check them out, like their Facebook page and share the campaign with your friends. They operate on a shoe string budget and their marketing is solely word of mouth, so any help spreading the word is greatly appreciated. More on this next week! I love this so much, I can’t stop smiling. I think that Brooke is awesome and brave for doing such amazing work!! Just an FYI target has loaded their $1-$3 section with teacher goodies and school supplies. They had blank 8 page books in packs of 3 for $3. Incase Brooke needs to create more masterpieces! 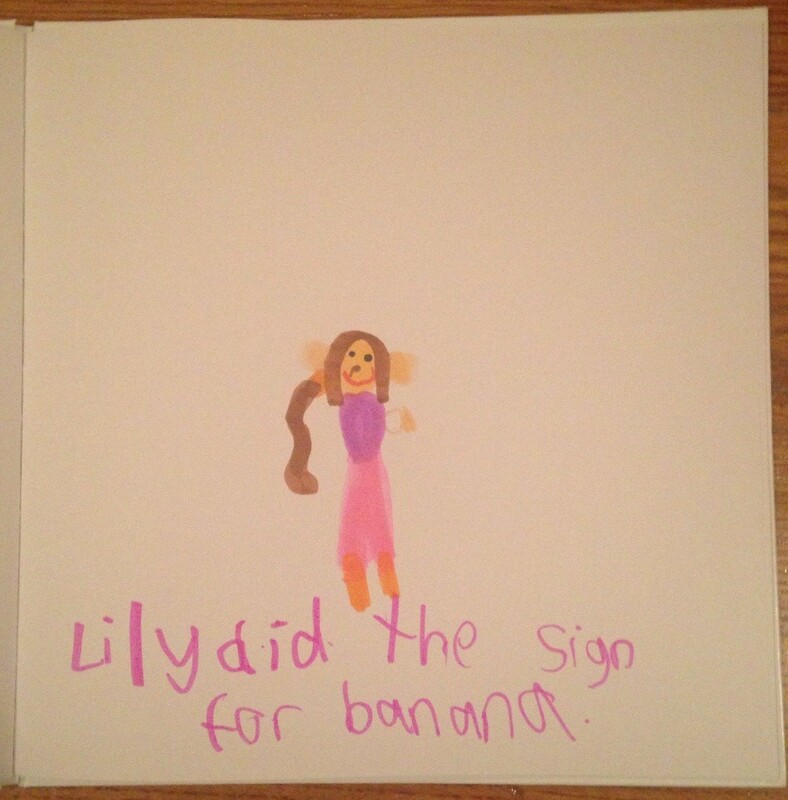 “Lily did the sign for banana”: this should be a shirt! Love it, and everything about this story, so much fun. 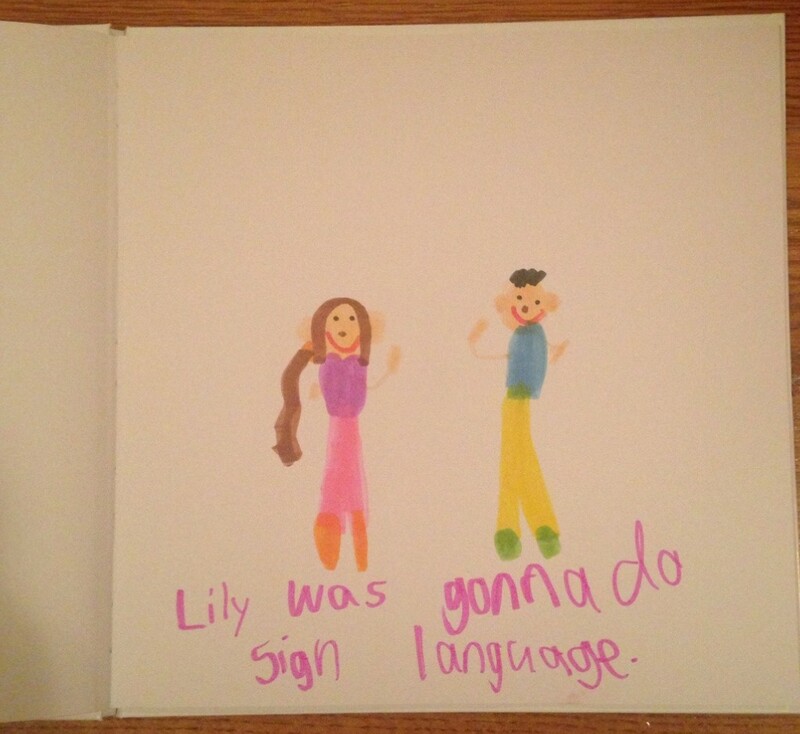 Love the text and colorful drawings (your mom commentary was amusing too — those orange pants). Love the story, Brooke! And, so did Makenna! I am so in love with Brooke right now! What a great, great, AWESOME piece of work. I can’t wait until my shirt with her artwork arrives! Ok Jess. Day 2 of my adventure of trying to comment where you can see it! I’m a mom of 5, sometimes I refer to myself as a crazy mom of 5, but nonetheless, I’m not crazy in a scary, stalker kind of way. Lol. I’ve followed your page for a long time and am always so impressed with your ability to express your feelings so clearly that they can be felt by the reader. Not only are they felt, but even though I do not have a child with autism, I can relate to your feelings of joy and frustration, of fear and happiness. I was curious if you lived far from the city, or close. I’m flying to Boston on Thursday with my 19 yr old daughter, and am flying out Saturday. I was just seeing if you did live in the city if you ever meet readers for a quick cup of tea/coffee, a thank you for the difference you are making in this world, and a hug. I’m going to be in a crazy adventure, “Katie” may or may not think its a funny adventure, but I can’t say it publicly. If not this trip, someday, I’d be honored to meet you. My husband is from the North Shore, so we will be back again next summer. We live in Florida. Anyway, thank you for reading this if I even wrote it in the right spot, if not, this was my third try, when you find it eventually it will be like a message in a bottle or time capsule! Have a great night!